A Firework Display Company, American Manufacturer of High Quality Firework Display Shells, & Special Effect Displays. Since we are a firework display company and incorporate 65% of our own manufactured fireworks into our firework displays, we do a lot of manufacturing year round. We are an American manufacturer of Class B, 1.3G and 1.1G firework display shells. Our manufacturing plant is located about an hour south of Pittsburgh, Pennsylvania. Below is a picture of some of our many stars. All of our color stars are made with magnalium to insure bright and vibrant colors of every hue in our firework display shells. Some of these colors include deep red, vibrant green, royal blue, majestic magenta, bright yellow & orange, glittering chrysanthemum, lush tiger tail, firefly, willow, twinkling gold, silver & white glitter & many more. These colors can also be mixed in any variety, or change from one color to another. Our company manufactures all of our inserts such as whistles, serpents, tourbillions, hummers, and artillery. We also can add color to the inserts so the inserts shoot out of the shell with colored streamers, or gold or silver steamers. Or we can make the inserts to end in small, but loud reports. These inserts are then put inside our specialty firework canister shells. We manufacture our rising tails as well, and our whistle garnishes for our shells. The whistle garnish adds a beautiful silver tail as the shell leaves the mortar and either ends in a salute, color shell, or specialty shell. 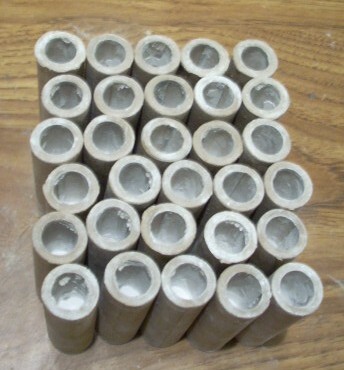 The rough powder, or polverone powder used to pack the firework shell with is also manufactured by our company. The other shell components such as the black match and leader pipes are all manufactured by us as well. 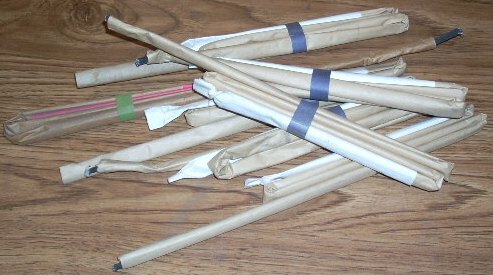 We roll the cans for the firework shells, assemble the shell, string and paste each shell with proper string & paste paper layers, and finish the shell with the tradional outer wrap of brown kraft paper tied at both ends. We do not take any short cuts with our products, they are all done the traditional way, with much care taken in the manufacturing, assembling, and finishing of each firework display shell. Filling the the our Specialty Firework Display Shells with the stars, burst, and polverone. 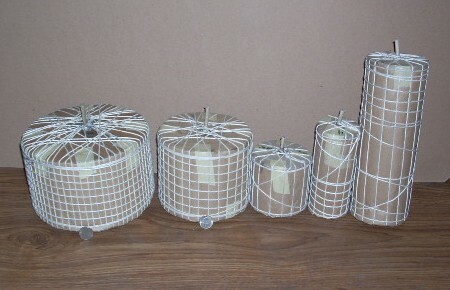 These are our Specialty Firework Display Shells after they are strung, ready to be pasted. These are our Specialty Firework Display Shells after they are pasted, ready to have the final outer layer of lift wrap put on the shell. 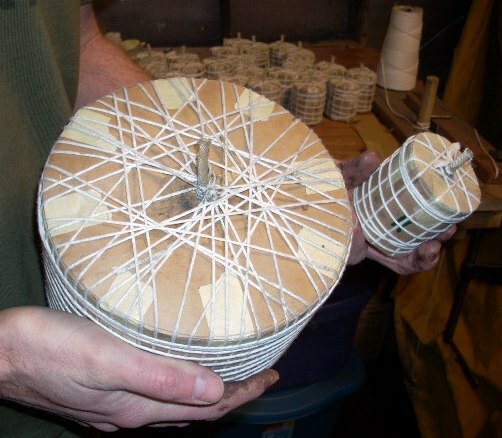 This lift wrap contains the lift on the bottom, keeps the leader secure by tying it on top of the shell, and finishes the shell all at the same time. More pasted Specialty Firework Display shells. 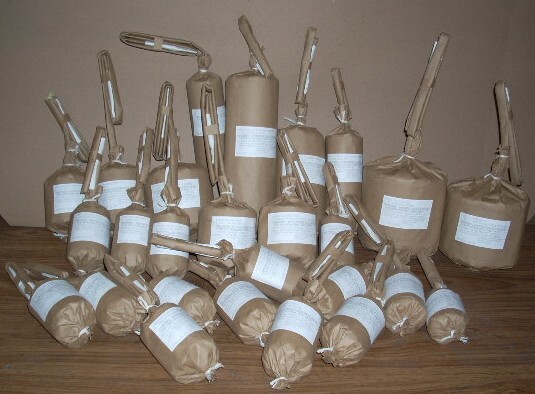 These are the Specialty Firework Display Shells after they are finished, with their labels and leader bands. They are ready to go! All of our firework display canister color shells and specialty firework display shells contain vibrant colors, a wide break, and we can add as many color combinations in a single shell as you would like. Our canister shells contain twice as many stars as a comparative ball shell. For example, our three inch canister shell contains as many stars as a four inch ball shell, our four inch canister shell contains as many stars as a five inch ball shell, and so on. When our color canister shells break, you get an explosion of colors that fills the sky. Our burst for the firework shells break the canister shells very symmetrical for a canister-type shell. All of our stars are manufactured by our company with formulas that we carefully made to perfection for the brightest and most vibrant colors you can find. We use magnalium in all of our color stars and even in our glittering chrysanthemum stars. Our colors last much longer than imported shells, our colors stay on for 3 to 5 seconds for a single color star, and twice that for a two color changing star. Our Specialty Firework Display Shells, such as our Color, Silver Whistles, and Report shell breaks with a beautiful spread of brilliant colors, with silver whistles spinning out from the shell, and once the color & whistles finish, there is a loud report at the end. Theses types of firework display shells make your display a very original and unique firework display that your audience will really enjoy and notice the difference from other displays. If your company is interested in purchasing our manufactured firework products, please contact us for a price list and product descriptions.